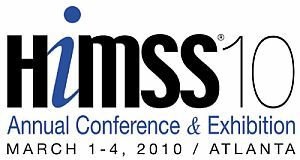 This week about 28,000 healthcare IT professionals converged on Atlanta for the 2010 Healthcare Information and Management Systems Society (HIMSS) conference. Among the hundreds of exhibitors were at least 36 Canadian information technology companies with a connection to healthcare. On the morning of the second day of the conference the Consulate General of Canada in Atlanta hosted an informational session, which I attended, for these companies to meet with U.S. businesses interested in working together. As usual, the outstanding staff in the Atlanta office of the Consulate General acquitted themselves well in pulling together an excellent event. Because the Olympics had just concluded a couple of days before on a high note for Canada, there were more than a few figurative tips of the hat to the visitors from the great north. It was nice to see Canada receiving the benefit of the goodwill generated by its successful hosting of the Winter Olympics. A particularly humorous moment was a light-hearted expression of support (which I think was appreciated by most of those in attendance) by a U.S. panelist for the celebratory exuberance of the Canadian women’s hockey team after winning gold — a candid display of youthful joy and enthusiasm that many in the U.S. readily understood and had no problem with. More impressive though was the depth of technical and business talent displayed by the three dozen or so Canadian companies in attendance. While Ontario not unexpectedly had the largest contingent, many of the other provinces were also well represented. The innovative solutions offered by these companies included mobile device accessibility to healthcare information, one-stop health information storage applications, telemedicine software, electronic patient charts for paramedics, and web-based assessment tools for behavioral issues, among many other amazing offerings. Canada is obviously holding its own in the critically important healthcare IT arena.